You are currently browsing the category archive for the ‘hot pepper eating contest’ category. The first orange habañero pepper goes down easier than expected. Maybe it’s because I practiced eating one of the peppers—which is 30 times hotter than a jalapeño—on the Wednesday night before the competition. Or maybe it’s just because I’m riding a high in my first competitive eating contest. After all, now I have a crowd and nine fellow competitors. 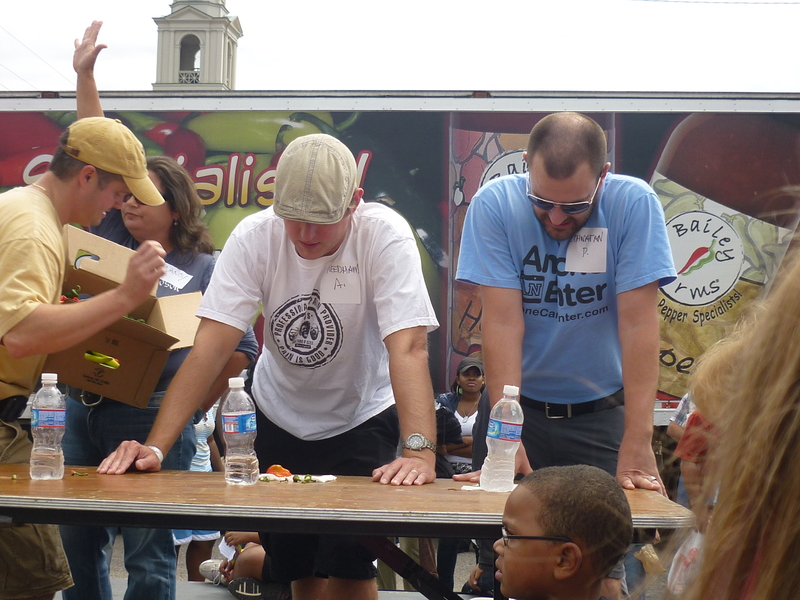 Or maybe it’s because a $300 prize is on the line in the Second Annual Bailey Farms Chile Pepper Eating Contest. Either way, the burning isn’t so bad this time. Not like in my practice round when I thought I was going to pass out. Nope, I’m ready for another round. And another. And another. Whatever it takes to claim that prize money. But then it’s time for the second habañero. Before I finish chewing, the first pepper starts to really kick in. I’m beginning to sweat. My chest is an incinerator. My mouth a flamethrower. To make matters worse—on what has thus far been an overcast day—the sun peeks out from behind a cloud and shines an unwelcomed extra ray of heat on this street corner in Oxford, N.C. I scan down the line of contestants. They’re starting to feel it, too. One of them has already dropped out. A woman wearing a Harley Davidson shirt says she’s ready for some real heat, but it’s clearly a defense mechanism. No one is immune to the pain from this blistering pepper. No one except 60-year-old William Smith. He’s the bald-headed contestant in a motorized wheelchair offstage. As I pace around the stage and fidget my hands, William seems perfectly content, showing no signs of discomfort. When he receives his third habañero, he holds it like a piece of candy, as if he cannot wait to eat it. I receive mine and study it with intense scrutiny. Where Williams sees a treat, I see a ticking time bomb. As an average-sized guy with an average-sized appetite, I never gave much thought to entering an eating contest. But when I heard about the Bailey Farms contest, I knew that I had a shot. I’ve always loved spicy food and I have a pretty high tolerance for pain. Plus, the contest was only in its second year, so I expected that it wouldn’t have much of a following. I couldn’t even find official results from the first contest, so it had to be winnable. And unlike most of my previous contests, this one required little training. It mainly consisted of eating Thai food, my practice orange habañero, and watching YouTube videos of other morons eating habañeros. 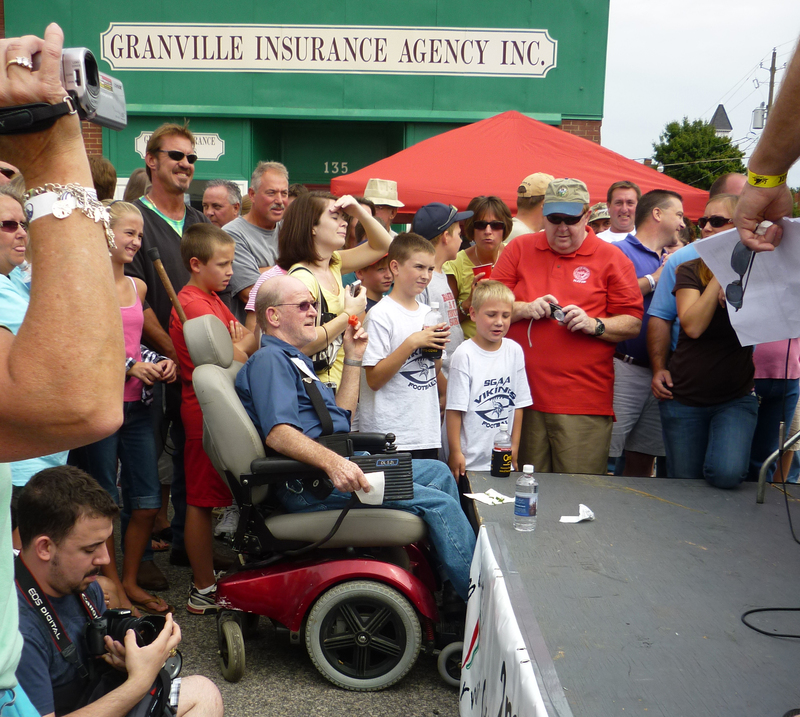 Unlike most of the people in those videos, however, Bailey Farms did not allow its contestants to drink milk during the contest. All that would be allowed onstage was a single bottle of water, which any true pepper eater knows will only spread the pain around the mouth. In one video, a college-aged guy ate nine of the orange devils. If he could do that with milk, I imagined that I could at least eat three or four without milk. I figured that would surely be good enough to win. 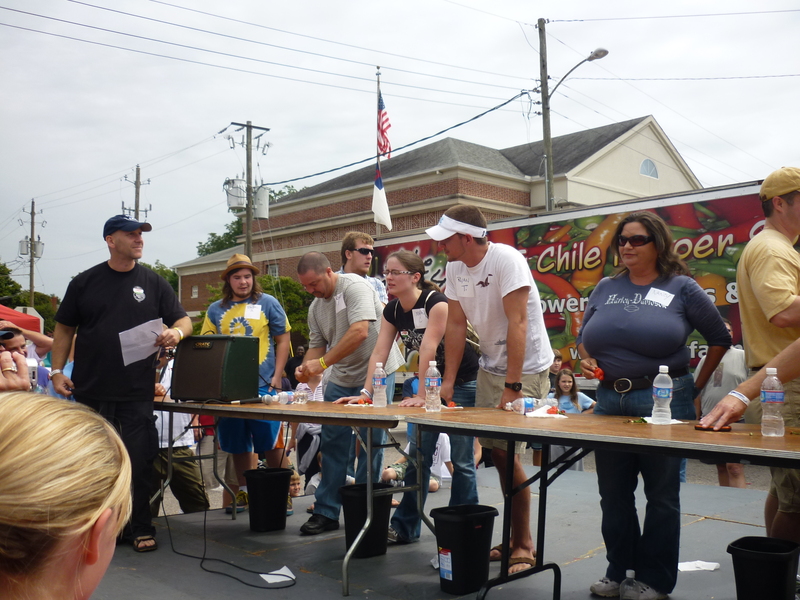 The Chile Pepper Eating Contest is actually just a sideshow at the North Carolina Hot Sauce Contest. In its inaugural year, the contest was held inside Stovall’s Gifts on Main Street. Now in its fourth year, the North Carolina Hot Sauce Contest has grown so big that Oxford shuts down four streets to accommodate all the vendors vying for the honors of top sauce. The Chile Pepper Eating Contest might be on a similar trajectory. When I arrive at noon, a representative at the Bailey Farms tent answers the question that had been on my mind for some time: How many habañeros did the winner eat last year? Actually, there were three winners. After eating two habañeros, they all decided to split the winnings. Perfect. I can easily stomach three, maybe even four habañeros. Now I just need to meet the competition. It’s a diverse group of 10 people including two women with ages ranging from lower-20s to mid-60s. I do my best to gauge their determination, asking several of them how they like their chances. All of them seem equally fearless. One of them even introduces himself with the nickname Straight Diesel. Moments later, I’m standing onstage and the emcee asks me to introduce myself. Upon telling the crowd that I am from Raleigh, I hear a few screams of support. Then it hits me. I’m not just doing this for the $300. I’m representing my hometown. And I even have fans. The contest begins with a Red Fresno pepper and a jalapeño. They’re spicy, but barely even a shadow of a preview of what is to come. All 10 of us gobble them down with little hesitation. With my third orange habañero in hand, I start to think twice about this contest. If I had been here last year, I would have been talking about a truce. Instead, here I am with eight other contestants. One of them picks up a trash can and nearly vomits, but only manages an offering of spit. He’s going to be fine. And so is the rest of the field. I consider folding when I hear my fans. I can’t let them down. I pull the stem from the habañero and stuff it in my mouth, nearly gagging. The pain is present throughout my entire body. My fingers and toes are tingling. I’m struggling to breathe. I hope to look down the row of contestants and see that someone else pulls out. They don’t. Oh well, what’s one more pepper going to hurt? I bite into my fourth pepper and go to work—and I do mean work. The orange habañero is small compared to most peppers, but it’s starting to feel like I’ve got a pepper farm in my mouth. And I feel like I’m licking the sun. And I want to vomit. After I finish it, I look at Carie, who’s filming me from the crowd. “Mind over matter,” she says. I try to tell her to look at William, but she has a bad angle. From my perch onstage, I can see him clearly. If he was eating candy in the second round, now he looks like he’s added ice cream to his feast. Except that it’s not particularly tasty ice cream. He almost looks bored and he still hasn’t flinched a muscle or broken a sweat. Suddenly, I have a brief moment of clarity in my pepper-induced state of delirium—William came here to win and he will not be denied. He must have a steel-lined gut and no taste buds. Whatever his secret, however, there is no way he’s going to lose and no way I’m going to beat him. I look down at the next habañero. It will be my fifth. I think about the misery I’m already guaranteed to experience later on the toilet. I decide to leave the stage. The smartest thing I do all day, besides exiting the contest, was probably stashing a bottle of chocolate milk in a backpack that Carie was wearing. After I leave the stage, I bolt for the backpack. Chocolate milk never tasted this good. Even as a kid. But each sip only provides brief moments of relief. Fortunately, it’s enough to help me keep my mind off the pain so that I can steal a seat on the ground near William. During the next 20 minutes, I watch him methodically eat his peppers while the field of contestants gradually dwindles to one other—a lip-ringed 20-something wearing a tie-dyed shirt named Randall. By now, they’ve each eaten about 10 habañeros. I say about because everyone, even the emcee, has lost count. In an effort to end this madness, the emcee starts issuing time limits of 10 seconds per round. William eats his in 5 seconds and waves his hands as if to say, “Could you please make this harder?” Randall appears to be violently ill, but he presses on. In an effort to wrap things up, the emcee hands each contestant a Naga Jolokia pepper (also known as the Ghost Pepper), an Indian pepper that is five times hotter than an habañero. (Until recently, the Ghost Pepper had been recognized as the hottest pepper in the world. That title now goes to the Infinity Chili, a pepper grown in England.) To be fair, they’re each given a full minute. Again, William looks unfazed while Randall looks like his head is going to explode into a million pieces. The emcee gives them the option of splitting the money. Randall appears ready to accept a deal, but William doesn’t even consider it. Round 13, supposedly, begins and ends. Again, the emcee asks if they’d like to split the money. The crowd, now possibly worrying that they may witness someone die in front of them, nearly begs them to split the money. William won’t have it. Finally, in Round 14, Randall can’t take it anymore. He spits out his pepper and William takes three $100 bills from the mayor of Oxford. William rubs a tissue underneath his eyes. His first sign of weakness all day is a tear of joy. Later, after William poses for pictures and has an interview with a local paper, I ask him about his secret. Does he have a bionic colon? A robotic stomach? What? Despite a lifetime of unintentional training for this contest, William nearly made a crucial mistake. When he arrived in Oxford, he realized he was missing something. I’m not sure he needed them. Postlude: For those of you wondering what the hours and days after a pepper eating contest are like, I can assure you that it’s obviously no picnic. With the proper preparation, however, it’s not the end of the world. The night before the contest, I asked my local pharmacist for some advice. “I don’t think they make anything for that,” he said. But he did recommend that I take some Tums before the contest and grab some Pepto Bismol for the next day. I also picked up a box of wet wipes. Those things are lifesavers. 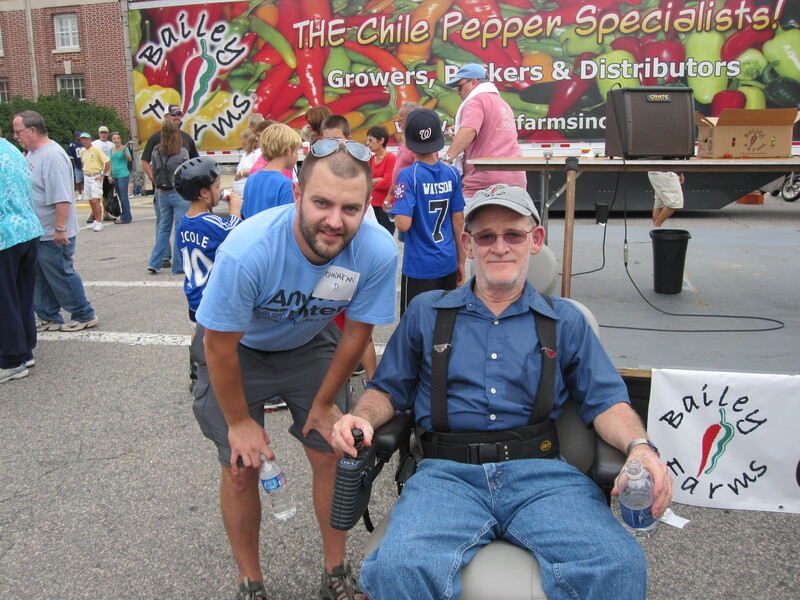 Me with pepper eating champion William Smith. Training for my next event, a hot pepper eating contest, has taken me to a new level of discomfort. Against my better judgment, I gave myself a preview of the final round of the contest by eating an orange habañero. If you’ve never tried one, imagine swallowing a box of fireworks. Better yet, just watch my reaction.